But what is a grain? A grain is the fruit or seed of a cereal crop. Cereal is a grass the produces a fruit or seed that is used as food. How that grain is turned into food can make a big difference in its labeling and its effects on your body. Grains are usually small hard dry seeds. They are composed of 3 layers. The outer layer is generally bran. The next layer is germ. And the inner layer is endosperm. All of these layers have nutrients in different proportions. A great many of the healthy components are found in the bran and germ layer. The most usual component of the endosperm layer is starch. To be labeled “whole grain” all you need to do is put together the bran, germ and endosperm in the same proportions as found in the original grain and make that combination 51% of a product. Most producers are not so foolish as to add a bunch of marshmallows and call their product “whole grain.” But even without the marshmallows, the product still does not have many of the healthy characteristics of intact grain. Processing the grain always affects the characteristics of the grain. But some processing only minimally affects the nutrient value of the grain. These minimal types of processing consist of stone grinding, steel cutting for oats, cracking for wheat, steaming and rolling for oats. The most common processing is milling. Milling is used to produce the many grain products that are produced from flour. Refined flour removes the bran and germ leaving only the endosperm. Whole grain flour adds back the bran and germ after having removed them. Because refined flour is composed mostly of starch it absorbs very quickly. Adding bran and germ slows absorption slightly. But because milling results in a fine powder (flour), absorption is quick even with whole grain. This is the reason for the high glycemic index of most baked goods whether refined or whole grain. An example of how this type of processing results in a whole grain product being almost the same as refined grain can be found by comparing whole-wheat bread to white bread. The glycemic index for whole-wheat bread is 71 and that for white bread is between 71 and 73. In contrast, coarse barley bread composed of 75 to 80% intact kernels has a glycemic index of 34 (1). High glycemic foods lead to a spike in blood sugar. It is not certain how much this spike contributes to the development of diabetes, but it does make diabetes more difficult to control once someone has developed diabetes. And it very likely contributes to an increase in obesity. In addition to the effect on the glycemic index, milling also has an effect on other nutrients. Fats are removed from the grain during milling. 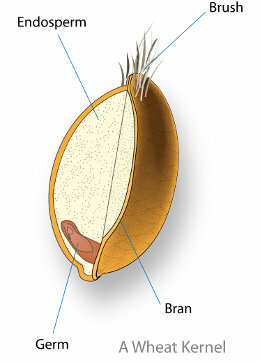 But they are not replaced when the bran and germ are added back to the endosperm to produce whole grain flour. This results in the healthy fats found in intact grain being absent from whole grain. In addition, potassium is often removed. Often potassium is found in a higher concentration in the bran and germ of a grain. But even when the bran and germ are replaced, the potassium may go lower. Raw oats have a potassium sodium ratio of 215. Oats with some bran removed have a lower ratio of 20. Raw wheat has a ratio of 170 – 218. Whole-grain wheat flour has a ratio of 182. Wheat flour for bread or cake has a ratio of 50 – 54. And self-rising flour has a ratio of 0.1 – 0.15. But it is not just the change in the flour that makes a difference. The way the flour is subsequently used may damage the ratio even more. Flour is often combined with baking soda or baking powder, which will increase the sodium and reduce the potassium sodium ratio considerably. It will usually reverse the ratio from being above 1 below 1. The above mentioned self-rising wheat flour is a prime example of this. Minimally processed grain, however, will still retain a very good ratio, even if it is lowered somewhat. Steaming simply drives water into a grain to soften it with minimal loss of potassium. Steel cutting will not affect starch absorption or the potassium sodium ratio. Roasting and toasting are also often done to a grain. This will have minimal effect on the potassium and the sodium although the heat may affect phytochemicals and antioxidants. Knowing that processing changes the characteristics of grains means it is best to avoid processing as much as possible. Intact grains can be used for many products that are normally made from refined grain or whole grain. As can be seen from the coarse barley bread example, a very tasty product can retain healthy characteristics. But “whole grain” is not good enough. The grain should be intact.